CBC host/actress/filmmaker, Sook-Yin Lee's sophomore feature Octavio Is Dead! is a randomly episodic ghost story, with Sarah Gadon as a cross-dressing young woman, investigating her dead father's secret life. This sounds more radical than the actual movie, a young-adult drama about accepting sexual orientation and appreciating books. Gadon stars as Tyler, a young woman who loses her job at a bookstore and flees the home of her overbearing mother (Rosanna Arquette), to move to the apartment of her recently deceased father, Octavio, a Mexican-born poet whom she has never known. After what amounts to thirty minutes of preamble, the action picks up when Tyler discovers that Octavio (Raoul Max Trujillo), though technically dead, is still around. 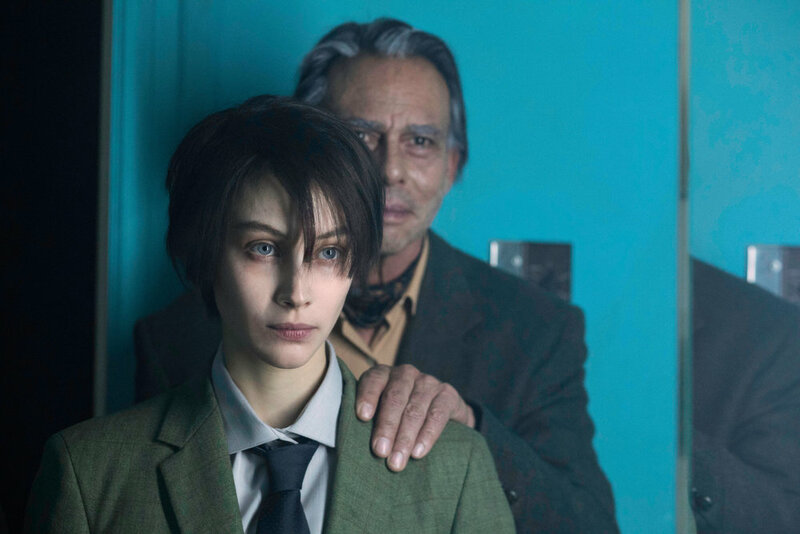 Her dad's ghost (Raoul Max Trujillo) approves of Sarah Gadon's new look in Octavio is Dead! He shows up as a very material ghost on the second night of Tyler's stay to introduce himself and report on his troubled spirit. He continues to randomly pop in and out of the narrative without staying around long enough to be properly interviewed. It doesn’t help that the mood is broken by an eccentric, busybody neighbour woman (one of several David Lynchian touches here) who bursts into the apartment. Finally, Tyler follows a stranger from Octavio's gravesite to a retro David Lynchian "Gentlemen's Club" where women who aren’t performers aren’t allowed in. This impediment prompts Tyler's decision to chop off her hair in a pop star “do,” put on one of Octavio's suits and head to the club. Miraculously, by lowering her voice, ordering whiskey and puffing on a cigar, Tyler not only passes the guy test, but excels. She beats a bunch of men at a shooter video game, while an old-fashioned burlesque dancer performs onstage tooting on an aqua-marine kazoo. By the end of the evening Tyler meets a likeable young gay Greek man, Apostolis (Dimitris Kitsos), who was a former student of her father's. They spend a peculiar night on the town, talking philosophy with Apostolis' roommate, going to a nightclub and later watching a flute-and-violin duo, before crashing. The word "random" seems to have been coined for such evenings, and indeed, for the diffuse, episodic quality that characterizes the movie as a whole. Octavio Is Dead! nods to horror, with flickering lights and groaning music, before it sheds its Hamlet theme. There's little practical reason for Tyler going undercover, and the eventual revelation about Octavio's secret life confirms the obvious. Mostly, the story is like a mannequin on which to hang images. And the seams clearly show. The visual digressions include a brief black-and-white dream sequence, in which Tyler dreams of her father in a student protest; and a leafy conservatory where Tyler showers, seated, posed like a Renaissance statue. Gadon, with her reserved manner and watchful gaze, is effective at holding the film's disparate elements together, as the character grows from passivity to assertiveness. And Trujillo, with his husky-grandeur, brings a welcome theatricality to the role of Tyler's supernatural teacher. One disappointment, bordering on annoying, is the part written for Arquette as Tyler's mother, a one-dimensional whiner who fails to appreciate books and gay people. She gets little credit for raising her daughter, before the ghost of Octavio shows up - like dad coming home late from work, to earn all the cheers. Octavio is Dead! Directed and written by Sook-Yin Lee. Starring Sarah Gadon, Raoul Max Trujillo and Rosanna Arquette. Opens Friday, June 22 at Cineplex Yonge and Dundas theatre.